Our first newsletter keeping our customers informed as to the old and new products that we have ongoing. Photographs of our new products will be posted online as soon as possible together with approx delivery times. The Sunset 'Flying Scotsman' are now almost sold out with only a hand full remaining, we still have a few of the 1928 A1 version available with or without sound. Please contact us for details. As you know our current project the L.N.E.R. A4 will be available in version 1 "Silver Fox", version 2 "Mallard" and version 3 "Sir Nigel Gresley". They are at the present time almost finished preparing all of the parts and have started assembly, with completion due by the end of spring. Scott Mann is due to visit the factory in the next few weeks to inspect the progress and will report back to give us an update. He will, when the first ones are complete, provide us with pictures to put online. Those customers who wanted to see one of these models prior to placing an order at Telford 2009 might well be disappointed as we only have 20 models remaining unreserved, so I need to warn you, my advice is to book your version now. Although your reservation is a promise to buy, if you were not 100% satisfied with our quality and price, I would not hold you to your commitment, at least you would not miss out on a unique oppotunity. For those of you who have already placed an order and are concerned about the fall of Sterling against the Dollar, we are going to absorb most of the costs but do anticipate a small increase, assuming that it does not get any worse. 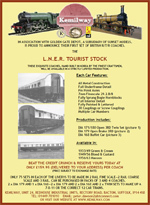 I have included with this letter our flyer (see below) for the first of a series of coaches for the L.N.E.R. These will be made in Korea to the finest standards. Again will be limited to only 75 sets at an incredible price, not seen before as R/T/R 7mm fine scale. So please, support our efforts and reserve yours today. If you have any thoughts as to what you would like to see made available as R/T/R, either as coaches or loco's, I would be very pleased to hear from you. Since we first started there are many other manufacturers in this market but very few making available quality models at affordable prices. Sunset has over 30 years experience in producing the very best Korean brass models.